Yesterday we were walking along the Pacific Coast Highway going towards San Clemente and a Lady slowed her vehicle and asked if we were doing alright. We responded we were. About thirty minutes later, Karen was standing on the bike path in front of us. So we stopped and had a friendly conversation. Karen said her grandfather had a mule and she loved mules. Karen asked us where we were going to spend the night. We said we didn’t know. She said we could stay the night in her backyard. We said the Mules would tear it up if it was landscaped. She said her neighbor Debbie had eight acres and she would ask her. 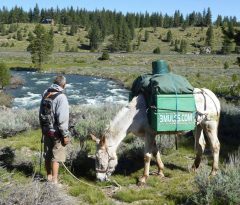 Debbie said yes, so the Mules walked a couple of miles to Debbie’s house and spent the night. In the morning, Debbie and Karen went and bough the kids some hay. So the Mules say thank you to Karen, Debbie, Tiffany, Sabrina and Adam for giving their kindness and support to the Mules as they continue the journey of bringing the light, shining the light, spreading the light of the Natural World into the man-made world (Megatropolis).